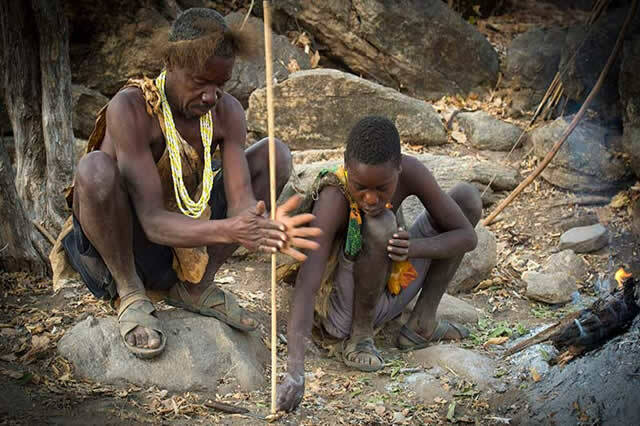 The Hadzabe, or bushmen, are among the last true hunter-gather societies left in the world. They are closely linked with San in southern Africa, who live hear the Kalahari desert (the stars of "The Gods Must Be Crazy.") They hunt on foot with bow and arrows, don't have permanent homes and speak a "click" language. The National Geographic ran a great article on the Hadzabe in the Dec. 2009 issue. One of the bushmen we met was photographed in the article. Like the Datoga, they live near Lake Eyasi. We got up WELL BEFORE dawn one morning to catch up with them and go hunting. When we first got there, the hunters were still getting ready–putting on baboon fur headdresses, checking bows and arrows and smoking joints. Apparently, marijuana has become a big part of their lives. Around the campfire, there were an older man, who was fletching arrows, and an older woman, who was weaving fronds into long strips that I think get made into baskets. They told us that all the other women and children had been gone a day or two, hunting for honey. Fiona was disappointment that she didn't get to meet any "bushmen children," as she called them. As hunting with the bushmen requires running through the woods for a couple hours, Fiona and I stayed behind. She was also quite apprehensive that they might catch and kill a baboon, which is one of their favorite targets. While they were gone, we hung out with the basket-making lady and the arrow-making guy. Apparently the hunting trip was quite exciting, although they only came home with a squirrel and a bird. The bushmen immediately threw them on the fire — whole and un-gutted. As they cooked, they pulled fur and feather off once they were charred. They would pull a piece of the bird or squirrel off the fire and use their knives to cut off cooked bites, which they offered around. We all had some. I think they probably eat every last bit of the game.